I have been asked a few times for a diy on turning cruise control switches into a radio remote switch, so here is as close as you will get. Honda has been putting redundant controls on since the 1st gen Legend. This was originally done by having separate switch inputs into the radio. In the mid 90's there was a change from multiple inputs to a single control wire input. The single wire connected to ground via different resistances provides for control over Volume up, Volume down, and preset up/Track up. Only certain radios had the capability and all seem to different pin configurations until the 1998 generation. With 98 generation 20 pin radios, all have the remote input on pin 3. Starting with the 2003 generation radios, two more functions are added, Mode and preset/track down along with a change in resistances. With the 98 radios, all the double dins I have come across have remote capability. Even if the car it came in didn't have the option. You can test by connecting a 100ohm resistor between pin3 and ground, the volume will go down. When I bought my CRV in 2002, I figured out the stock radio was capable of remote control. Before I figured out which steering switch to add that would fit my steering wheel, I wired up the cruise control switches to dual function as a radio remote. Since that radio was laying around collecting dust I put in the accord and of course wired up the cruise switches to control the radio. This is fairly easy to do if you are electronically capable and will cost about $20 in parts. 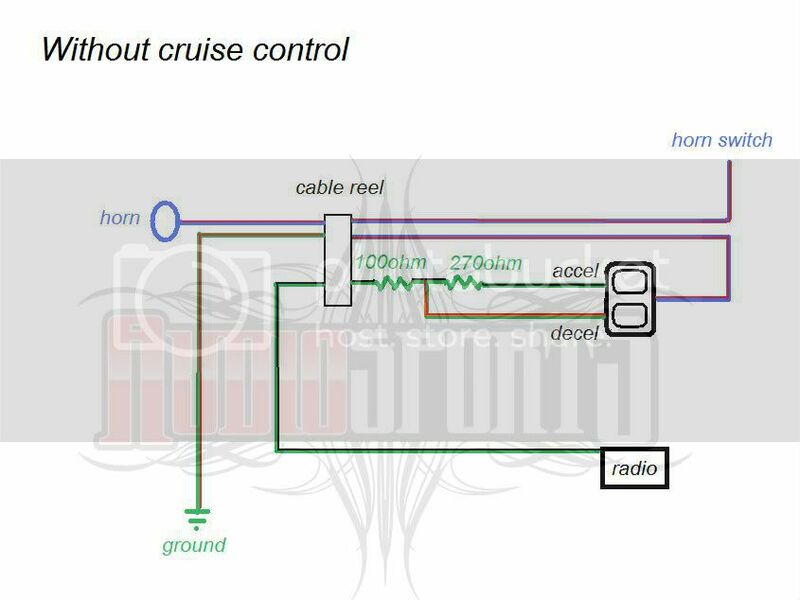 There only five wires to connect to the vehicle, 4 at the cruise control module= accel, decel, cruise on+, ground and 1 at the radio= remote in. The hard part is wiring up the relays. It is actually a complex circuit that use 3 relays. The first two control the radio and the third shuts off the remote function when the cruise is turned on. This is my latest created circuit which only uses 3 relays. I have yet to use it in an actual vehicle but works perfectly on the bench. The setup I am using in the accord is much simpler design only using vol+ and vol- and not the track/seek+. 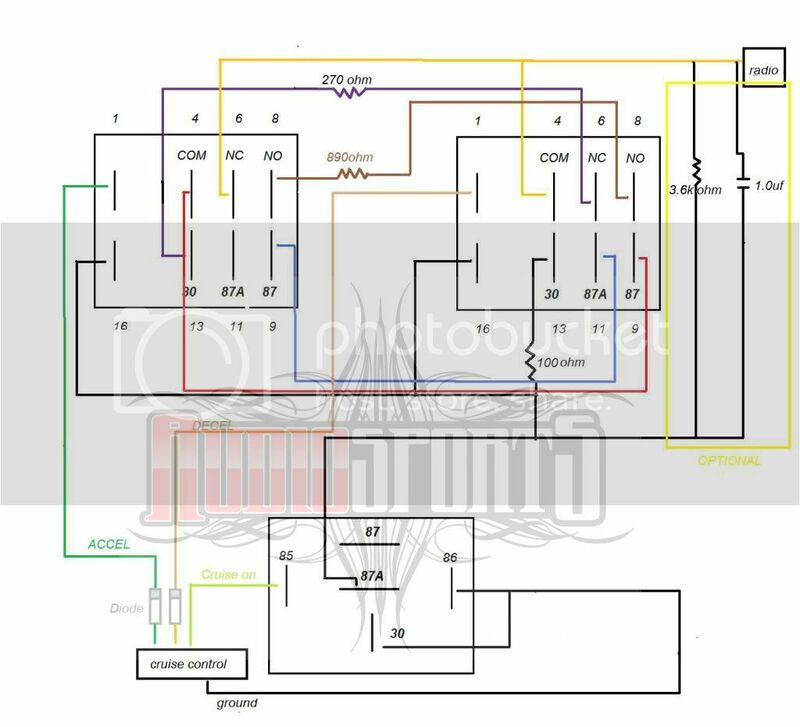 Wire the relays according to this diagram. Pay close attention, it will probably be confusing to most of you but follow it exactly and don't rush. Be very careful handling and soldering the relays as the pins are very easy to break off. When finished place inside a project box. An optional cap and resistor on the diagram are present inside the factory remotes. It works without them but I think 3.6K is maybe a terminator to let it know when commands are not present and the 1.ouf cap is to smooth things out? I am sure Honda had a good reason for them. 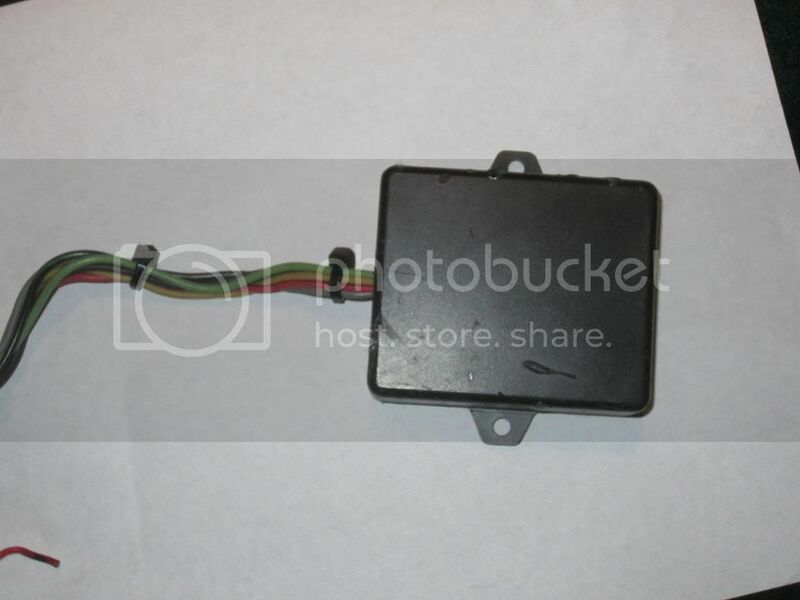 If you put in a 98-99 Acura CL(The service manual shows it using the older style connector) connect to pin 12 it is the left one the 2 most center terminals on the bottom row. If you are installng a 98 up radio, Connect the remaining remote out wire to radio pin 3. Reading from wire side of connector from top left. Mount the box under the dash near the cruise module and enjoy. If you don't have cruise control, add the slip ring. Then you just need to rewire the switch inside the wheel adding resistors and cut the wires on the other side of the cable reel. 92 CB7 F22 5 speed. how hard to wire that into a 92 cb7 lx? What watt rating were your resistors? I see some 1/4 watt, 1/2 watt and 1w. Does it matter? I can find enough of the r40-11d2-12 relays, so would the r40-11d2-24 work? Are there any other specs for the diodes you used? Should I just pick up some 30v diodes? What's the dimension of your box? Dis you put these on a bread board or did you just wire them up and set them loose in the box? 1/4 watt resistors are fine. The r40-11d-24 is 24v so it will not work.